^ G. W. S. Barrow, Robert Bruce: and the community of the realm of Scotland (4th edition ed. ), p. 34 :- "This was indeed a marriage of Celtic with Anglo-Norman Scotland, though hardly in the protagonists themselves, since Majorie was descended from Henry I, her husband from Malcom Canmore. But Annandale was settled by people of English, or Anglo-Scandinavian speech, and thoroughly feudalised. Carrick was historically an integral part of Galloway, and though the earls had achieved some feudalisation, the society of Carrick at the end of the 13th century remained emphatically Celtic." ^ a b King Robert the Bruce By A. F. Murison. ^ Robert's absolution for Comyn’s murder, in 1310, gives Robert as a layman of Carrick, indicating Carrick / Turnberry was either his primary residence, or place of birth. Lochmaben has a claim, as a possession of the Bruce family, but is not supported by a medieval source. The contemporary claims of Essex / the Bruce estate at Writtle Essex, during the coronation of Edward, have been discounted by G. W. S. Barrow. ^ Geoffrey le Baker's: Chronicon Galfridi le Baker de Swynebroke, ed. Edward Maunde Thompson (Oxford, 1889). 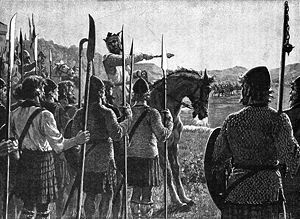 ^ Scottish Kings 1005 – 1625, by Sir Archibald H Dunbar, Bt., Edinburgh, 1899, p. 127, where Robert the Bruce's birthplace is given "at Writtle, near Chelmsford in Essex, on 11 July 1274". Baker, cited above, is also mentioned with other authorities. ^ Scott, Robert the Bruce, p. 29. ^ Scott, Robert the Bruce, p. 72. ^ Ronald McNair Scott (1988). 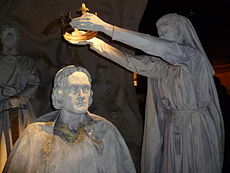 Robert the Bruce, King of Scots. Canongate: p. 72. ^ Scott, Robert the Bruce, p. 74. ^ Scott, Robert the Bruce, p. 75. ^ Scott, RonaldMcNair, Robert the Bruce, pp. 84–85. ^ Scott, Robert the Bruce, pp. 84–85. ^ Barrow, Geoffrey Wallis Stuart (2005). Robert Bruce : and the community of the realm of Scotland (4th edition ed.). Edinburgh University Press. ISBN 0-7486-2022-2. . (Retrieved from Google Books). ^ Lauder-Frost, Gregory, FSA Scot,Darr Some Descendants of Robert the Bruce, in The Scottish Genealogist, vol. LI, No.2, June 2004: 49–58, ISSN 0300-337X. ^ John McCain, veteran war hero: yes. But a descendant of Robert the Bruce? Baloney. ^ silkroaddestinations.com – Uzbekistan, Shakhrisabz. Barrow, G. W. S. (1998), Robert Bruce & the Community of the Realm of Scotland, Edinburgh: Edinburgh University Press, ISBN 0-85224-539-4 . Bartlett, Robert (1993), The Making of Europe, Conquest, Colonization and Cultural Change: 950–1350, Princeton: Princeton University Press, ISBN 0-691-03298-X . Bingham, Charlotte (1998), Robert the Bruce, London: Constable, ISBN 0-09-476440-9 . Brown, Chris (2004), Robert the Bruce. A Life Chronicled, Stroud: Tempus, ISBN 0-7524-2575-7 . Brown, Chris (2008), Bannockburn 1314, Stroud: History, ISBN 978-0-7524-4600-4 . Dunbar, Archibald H. (1899), Scottish Kings 1005–1625, Edinburgh: D. Douglas, pp. 126–141 , with copious original source materiéls. Fawcett, Richard (ed.) 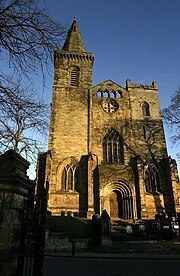 (2005), Royal Dunfermline, Edinburgh: Society of Antiquaries of Scotland, ISBN 978-0-903903-34-9 . Macnamee, Colm (2006), The Wars of the Bruces: England and Ireland 1306–1328, Edinburgh: Donald, ISBN 978-0-85976-653-1 . Nicholson, R., Scotland in the Later Middle Ages . Oxford Dictionary of National Biography, http://www.oxforddnb.com/public/dnb/3754.html . Ó Néill, Domhnall (1317), “Remonstrance of the Irish Chiefs to Pope John XXII”, CELT archive, http://www.ucc.ie/celt/published/T310000-001/ . Penman, Michael (2009), 'Robert Bruce's Bones: Reputations, Politics and Identities in Nineteenth-Century Scotland', International Review of Scottish Studies, 34 (2009), 7-73, Ontario: Centre for Scottish Studies at the University of Guelph . Geoffrey the Baker's: Chronicon Galfridi le Baker de Swynebroke, ed. Edward Maunde Thompson (Oxford, 1889).